TCMF Resumes TONIGHT at 5:30! Join us! Austin – The Ninth Annual Texas Community Music Festival returns from a short Easter hiatus for a non-stop, six day run beginning Tuesday, April 22, at Central Market North, 4001 North Lamar in Austin. EVERYONE’S A CRITIC! Apparently grackles don’t like tuba music. 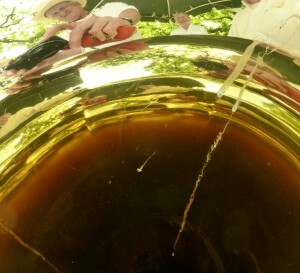 Solution — play a sousaphone! In case you missed Week One of TCMF, please take the time to enjoy our video and photo pages. Thus far, we’ve enjoyed great performance weather, great attendance and incredible music, as diverse as the soul of Texas herself. We expect much much more of the same. This week’s schedule runs from tonight through Sunday, April 27. Check the “2014 schedule” page for complete information. Texas Community Music Festival is presented by the Austin Civic Wind Ensemble and graciously hosted by Central Market. Please visit our Sponsors page and be sure to thank them for all they do for the community of musicians in Austin and Texas.